Okay, I'm no longer a "potential new glider mom!" We brought him home tonight! He is a 2.5 year old neutered male - rehomed. I know it is always best to get two babies from a breeder, but I think there isn't a high demand for the adults. He needed a home and we wanted to give him one. He crabbed a little when we moved his pouch from his traveling cage to his big cage after we got it set up. He woke up at 8:30 p.m. He's very social, coming to the front of the cage to check us out. No crabbing at all. Running on his wheel, eating. While we were there supervising, we had the door open so the cat could come in and check things out. As the cat was sniffing around, the glider was at the bottom of his cage (it's like the brisbane...up on a stand), at the side closest to the cat, up on his hind legs looking at the cat. The cat stopped and looked up at him. They just looked at each other for a short bit and the cat ambled on his way. No hissing, no crabbing. The cat then ventured off to lounge in the living room, despite the new family member in the bedroom. I was very impressed. Wouldn't the glider crab if he felt threatened? He seemed curious, more than anything. Then it was time to put the dogs to bed. The cage is in my daughter's room and the dogs sleep with her. As expected, our Chihuahua was beside himself. 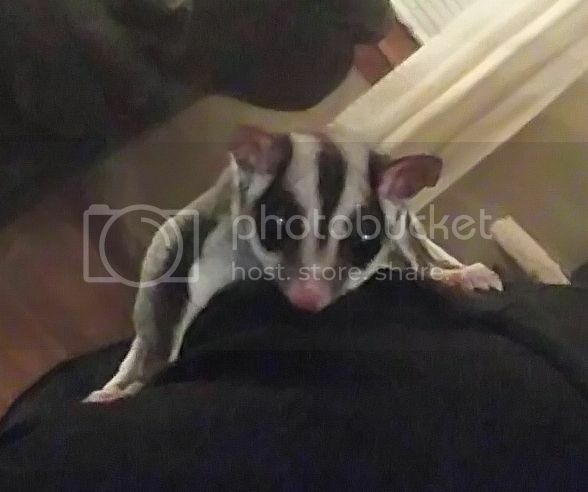 The glider looks too much like a squirrel or chipmunk. So, we finally kenneled him. But our Papillon could care less about the glider. So she gets to sleep in my daughter's bed. She got along great with my other daughter's hamster, so I wasn't surprised. Just to be clear, we don't have any plans to have the glider have one-on-one contact with our cat or dogs...we just want the cat and dogs to be able to be in the same room with the glider in the cage without conflict. We were going to give it a few days before we started daytime bonding pouch time. Does that sound right? Or, can we do that after a couple days? Not sure yet how to read the glider's queues. Can't wait to get a tent too. sounds like you are off on a good start! Congrats on bringing him home! Glad the first night went well so far! He will need a few days to acclimate to new sights and sounds. And most gliders when in new situations will crab a bit. He probably won't need a week. Since he is a single, he will want company, and things to do. I would give him some scented blankies with the family scents(sticking in laundry hamper), and he should be ready for a pouch ride in couple of days. Please keep us posted and let know how he's doing. Also we love pictures too! We forgot to sleep with fleece swatches last night, so I'm wondering if we can just rub them on ourselves tonight? Would that be enough to get our scent? Then...not quite here yet, but...how exactly do people carry their gliders in their bras? He came with these little fleece "envelopes" that he goes in and you tuck them/him into your shirt. I am having a hard time understanding how he wouldn't just slide down and out the bottom of my shirt! This morning he hadn't gone to bed yet when we were getting ready for school/work. No one was in the bedroom with him. Then I heard him barking. I'm hoping that's a good sign. He wanted us in there? He will bark when he's lonely, excited, wants someone to listen while he tells you a story, wants a treat, anything to get attention. Mine bark at 4:30 am 7 days a week. (My alarm goes off during the week). The pocket is more likely to tuck into a bra, or pin to the inside of your shirt. I told my hubby ours wouldn't fit in there, he said there is room (I'm not tiny)and by golly, they find the space. Some wear the pocket on the outside of their bra pinned or clipped, but it kind gives the impression of a 3rd bump(so to speak- trying to keep it PG -G rated). Some wear a camisole under their shirt to help hide it. Gliders like snug spaces. A regular bonding pouch is the way most wear them. If you don't have one, you can order them from ebay, etsy, or if you sew, there are all kinds of tutorials. And lastly, yes, you can rub the blankies on you. Preferably where there is no perfume, and stuff. When I take our babies bedding out of the dryer, turn inside out, and I rub it in my neck, face, and hair, arms too. Then I rub them on hubby as I walk by to put back in their cage. Last edited by Ladymagyver; 10/29/15 05:43 PM. Reason: I hate auto spellcheck!